Pope Tawadros II concluded his visit to Bari by heading to Rome for a three-day visit. Sunday 8 July began with Pope Tawadros II presiding over Holy Mass at the Papal Basilica of St Paul Outside-the-Walls, the second largest church in Italy. Participating with him were Anba Barnaba, Bishop of Torino and Rome; Anba Wissa, Bishop of Balyana; Anba Antonio, Bishop of Milan. During Mass, the Pope promoted Fr Angaelos Gaber, pastor of the church of Mar-Mina and Pope Kyrillos in Florence, to archpriest (Hegumen). 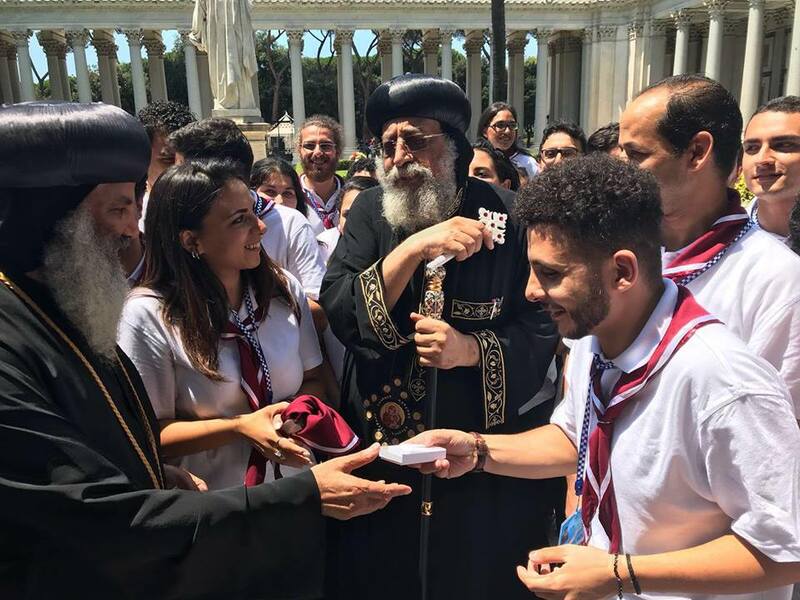 A young Coptic couple, Katy and Danial, members of the Coptic Church’s scouts, who were preparing to get engaged, asked the Pope to bless their engagement rings, which he affectionately did. 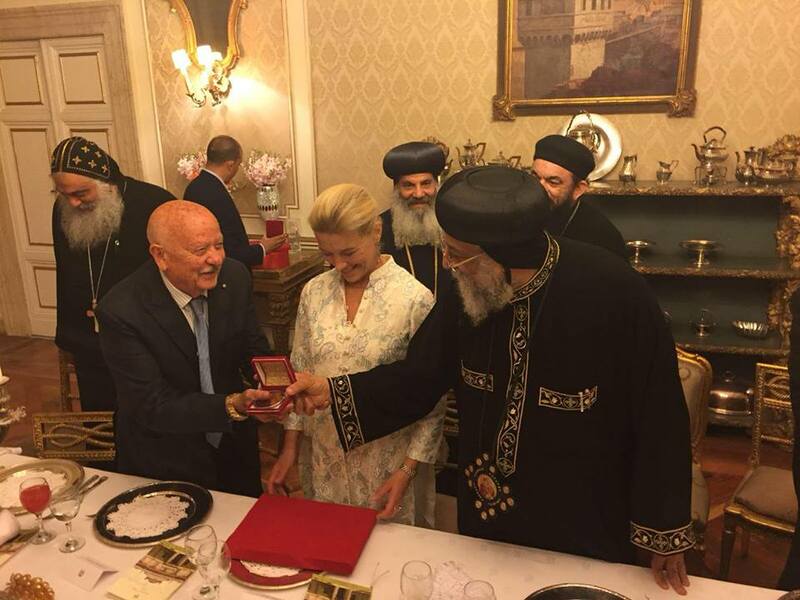 Anba Barnaba held a dinner banquet in honour of Pope Tawadros II at the Bishop’s residence in Rome. Hesham Badr, Egypt’s Ambassador to Rome and Mahmoud Sami Egyptian Ambassador to Vatican attended, as did the Egyptian Consul General in Rome, Sherif al-Gammal. From the Catholic Church, there were Monsignor Gabriel Kwick, secretary of the Vatican church unit office, Father Roberto Mota, Head of the Order of San Paolo, and Bishop Antonios Aziz. Also present were Anba Wissa and Anba Antonio, Bishop of Milan. On 9 July, the Egyptian Embassy in Rome held a reception in honour of Pope Tawadros II. 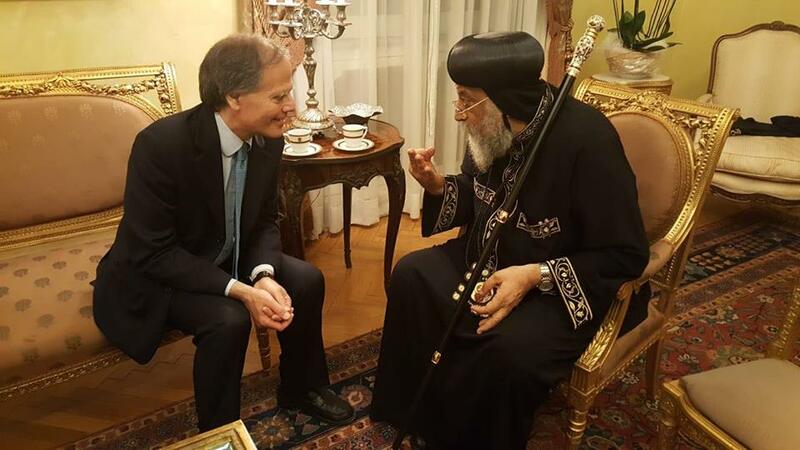 Italian Foreign Minister Enzo Moavero Milanese was present and expressed his happiness at meeting the Coptic Pope. 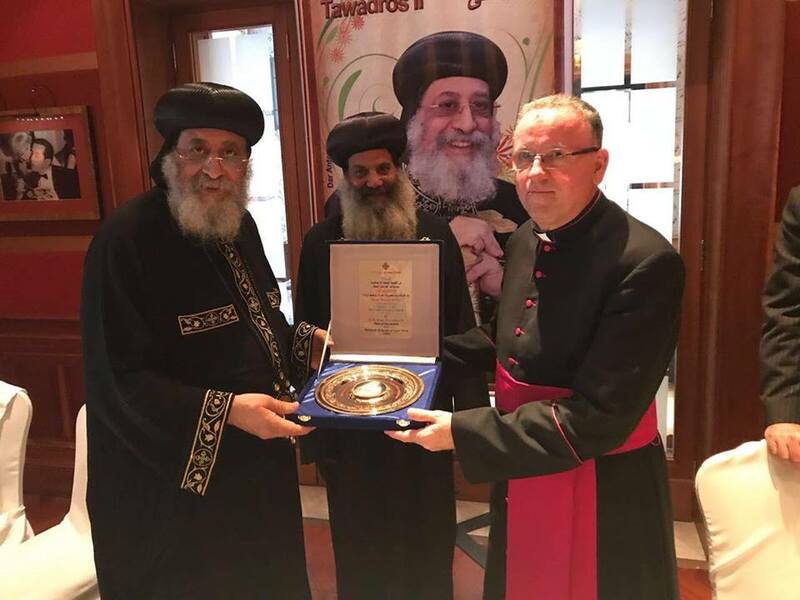 He applauded Pope Tawadros’s participation in the ecumenical prayer meeting, saying that it boosts the space for the freedom of worship that we aspire for. The Italian Foreign Minister commended Pope Tawadros’s role in spreading a message of love and tolerance and renouncing violence. “We are closely following the conflicts in the Middle East, which are making us increase our support of and relationship with Egypt, both on the political and economic levels,” Milanese said. On his part, Ambassador Badr expressed his pleasure and the delight of Egyptians in Italy for the Pope’s visit to Rome. 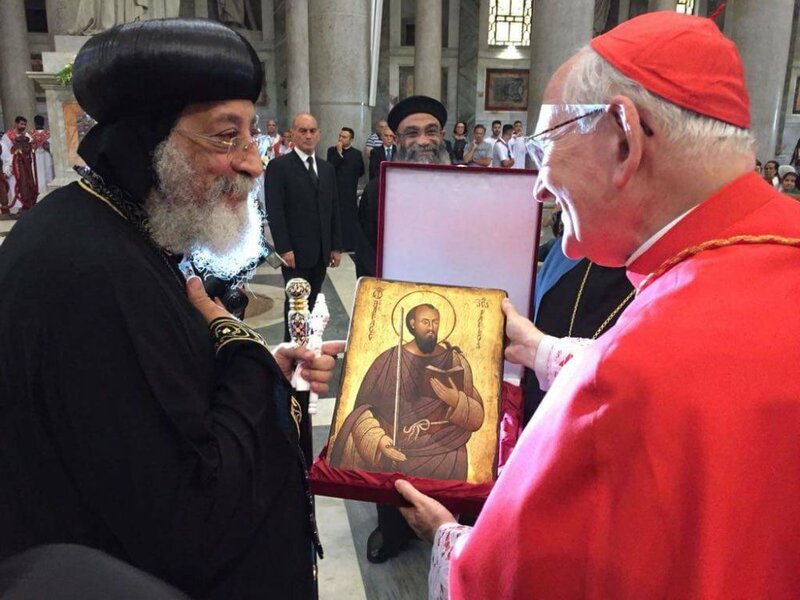 He said that Pope Tawadros offers a true image of patriotism, and reminded that through his wisdom he has protected Egypt and her people against sedition. “We are delighted to have you among us, you raise the name of Egypt high; your presence and prospective meeting with Italy’s President sustains relations between Egypt and Italy,” Mr Badr said. Pope Tawadros received at his Rome residence Italian businessman and philanthropist Eugenio Benedetti Gaglio and his family. Mr Benedetti is the great grandson of Empedocle Gaglio, who founded the Italian Hospital in Cairo in 1903, and was president of the Società Italiana di Beneficenza (SIB) that owns it. Mr Benedetti told the Pope that he had wonderful memories of visiting his grandfather in Egypt, visits that have nurtured his love for the country and bonded him with the people. 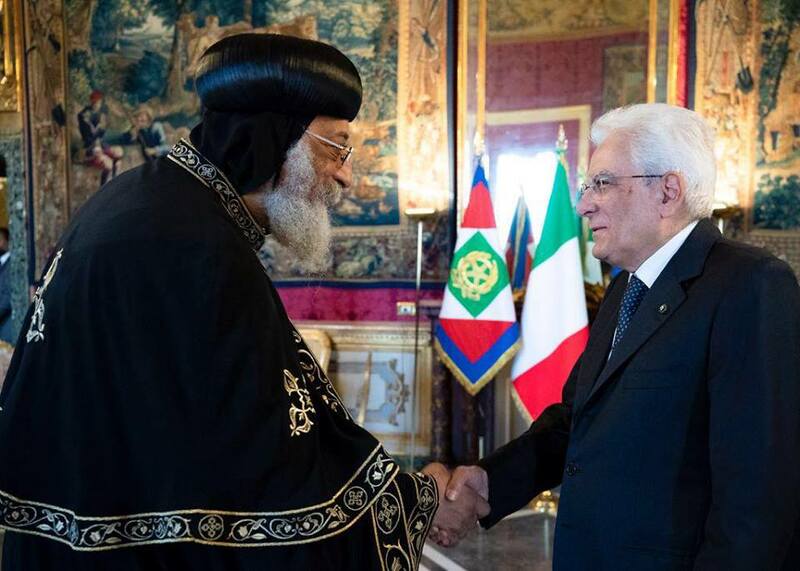 At the Quirinal Palace, the presidential palace in Rome, Pope Tawadros was received by Italian President Sergio Mattarella who warmly welcomed the Pope and expressed his pride at receiving him. “Your Church is an ancient Church, your voice is heard the world over, and your message of love, peace and helping the other is highly appreciated. 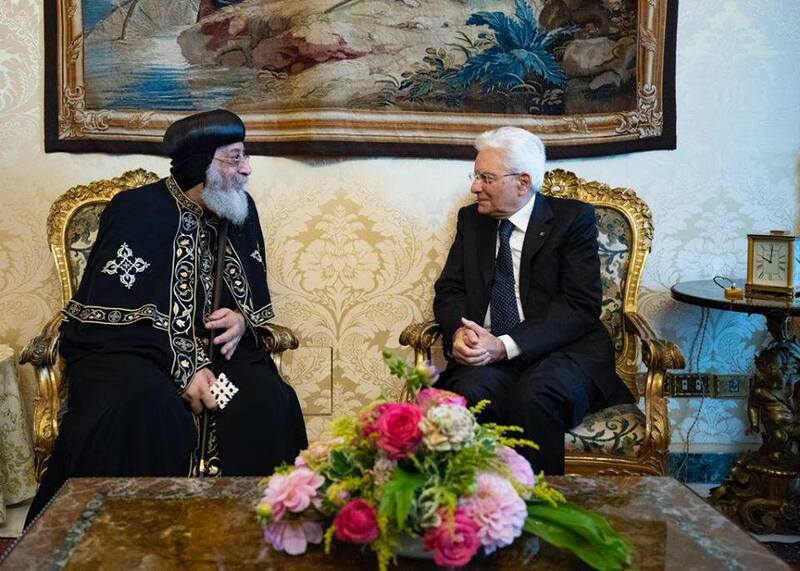 Your visit to Rome strengthens the bonds of friendship and fraternity between Italy and Egypt,” Mr Mattarella told Pope Tawadros. On his part, the Pope thanked the President for his warm hearted reception, and expressed his appreciation for Italy’s support of Egypt in her war against terrorism, and for caring to be part of the developmental projects that President Sisi and the government are carrying out to build a modern Egypt. The Pope invited President Mattarella to visit Egypt, pointing out that he has recently received the first Italian pilgrims who came to Egypt to visit the path travelled by the Holy Family during their Biblical flight into Egypt. Later in the day the Pope visited the Mayor of Rome, Virginia Raggi, at her office on the Piazza del Campidoglio where she received him on the doorstep of the building. The Pope said there was much in common between Egypt and Italy: as two nations overlooking and connected by the Mediterranean, they shared numerous customs and traditions. 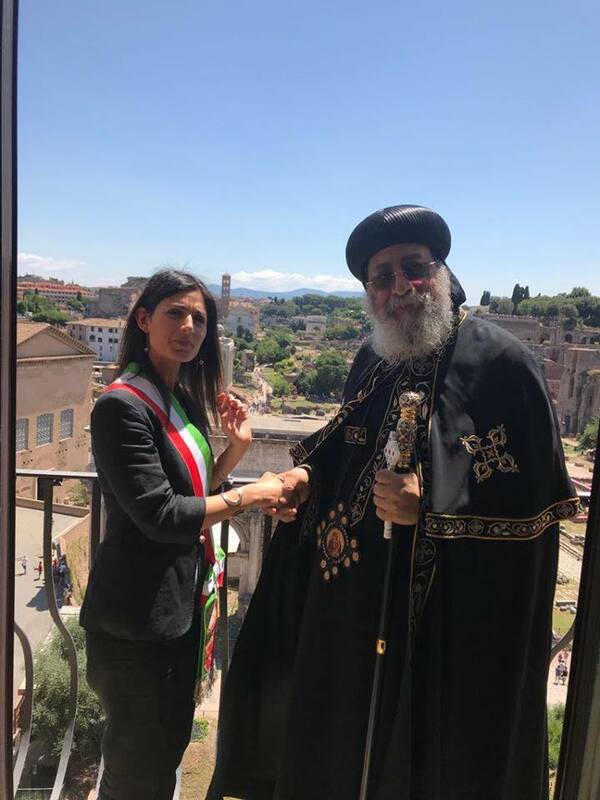 Pope Tawadros concluded his Rome visit on 10 July by dropping in on the Egyptian Embassy at the Vatican City where he was joyfully received by Mr Ambassador Sami. The Pope then headed to the airport from which he flew to Vienna.